Scattered about the Internet is a treasure trove of data, and more and more, it’s being used to manage people. Big data might be unstructured and unwieldy to many, and there are reasons for that perception. It’s collected from a variety of public and private sources — as well as internal and external means — so it takes focus and dedication to curate and manage it. But effectively analyzing this data can provide you with the tools for success. Perhaps one of the better-known examples of this practice can be found in the Oakland Athletics baseball team. General Manager Billy Beane hired “quants” to analyze the performance of potential recruits. The data was so powerful that it turned the team into a winner, as described in the book and movie Moneyball, but this method certainly isn’t limited to the baseball field. HR departments at companies like Google, Procter & Gamble, Intel, and General Motors are big data users, hiring dedicated teams of specialists to manage it. Smaller companies are getting on board, too. In fact, startup Visier built its entire business model around the idea. Its workforce analytics products provide complex predictive analytics for HR departments — such as which high-value employees are likely to leave — and it boasts customers like Yahoo, Nissan, and Hyatt. As an HR professional, it’s your job to find ways to improve company processes. If you gather and use the right data, you’ll have a much smarter picture of your people, and this new source of intelligence will be invaluable to the C-suite. Given Big Data’s power, it’s time to adopt it as a critical part of the value you offer. 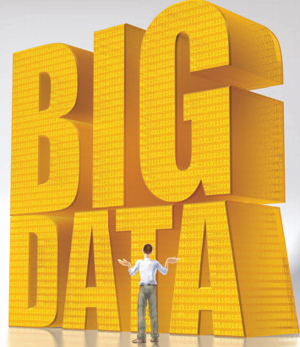 Where can you find Big Data? Public data — There’s publicly available information that could be analyzed by HR — from job postings to salary trends to brand sentiment and opportunities for poaching to labor market conditions and wage predictions by industry or state. Hiring data — It’s in your company, gathering dust. Think about it: How many résumés have you digitized? How many are sortable, searchable, and filterable? What about legal documents, benefits information, emergency contacts, performance reviews, and background checks? Performance data — Providing useful measures of performance or quantitative analyses of work completed can be very beneficial. Do you provide tools that tell people how much time they’re spending in meetings or how many times a day they check email? For some, this might seem a bit like “Big Brother,” but it’s important to communicate how valuable big data can be. After all, insight into work habits can be advantageous for employees and executives alike. Big data provides an entirely different picture of what’s going on. It’s knowledge you didn’t have before, so the opportunities it offers will lead you into a kind of management you haven’t known — one that will make a bottom-line difference. Perfect processes — Big data will provide insight into employees’ work habits so you can make suggestions for improvement. For example, you can learn that top-performing employees spent an average of eight hours a week in meetings in the second quarter. If someone spent 14, you can consider cutting down his meetings. Make employees self-aware — Similarly, automating this intelligence allows it to self-serve. Instead of a loop that requires HR to analyze and give critical feedback to employees, automation becomes a tool employees use to get feedback about themselves, making it more credible and acceptable. Foster smarter collaboration — Big data can show a manager who is meeting with whom and how often. Then, she can quantitatively analyze how much collaboration exists between certain teams and propose adjustments. Reward high-performing employees — Instead of forcing a manager to guess who her most productive engineer is, you can relate an employee’s output to revenues, customer satisfaction, etc. For example, if customer satisfaction at your store is higher in the morning, you can see who works mornings and reward them appropriately. Or if you want salespeople to close more sales earlier in the month, relate data from your CRM system to your employee records to reward those who do. Monitor brand sentiment and issues — For public companies, this helps recruiters and HR partners be aware of — and ready to respond to — concerns that may have originated outside the company but could be affecting employees or potential hires. Organize recruitment — Not only can Big Data monitor what potential hires think of your company, but it can also create a dashboard showing the week’s new job postings by title and geography, the change in average wages in your zip code, and announcements of layoffs. These could help recruiters determine when to target certain companies’ employees. As your company is infused with this intelligence, HR will be seen as more valuable and more directly tied to profit and loss. After all, quantitative data can’t be ignored. If HR needs to push managers, create a better bonus system, or improve hiring, statistics and data will force other executives to lend an ear. As companies look for every advantage in their hyper-competitive marketplaces, the ability to identify good employees and help them work at their peak is no longer nice to have. It’s business-critical — and Big Data is the key. Andy Barkett is the CEO of Getexp, Inc, and CTO for the Republican National Committee. He is also a managing partner at startup advisory firm Davis Innovators, which seeks promising ventures at early stages and offers a variety of services, from fundraising to talent planning. Andy has more than a decade of experience working in strategy and engineering at companies like Facebook, Livescribe, NVIDIA, and Google. You can connect with Andy on Twitter.